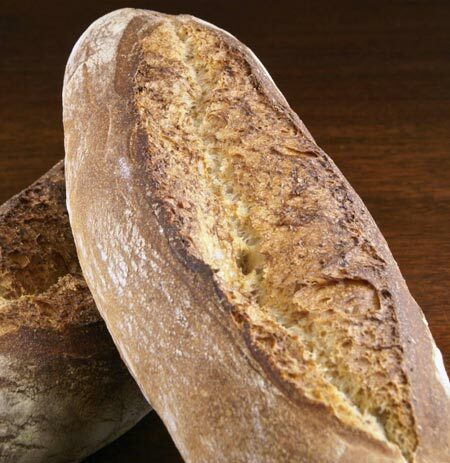 Pain de Beaucaire is one of those breads that is like true magic to me. It really seems impossible that a stiff dough could yield a bread whose crumb is as light and open as this centuries-old bread from Beaucaire, in the south of France. The secret lies in the bread’s unique shaping method. 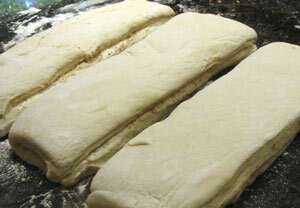 The dough is formed into two layers, with a layer of wet flour slurry sandwiched between them. 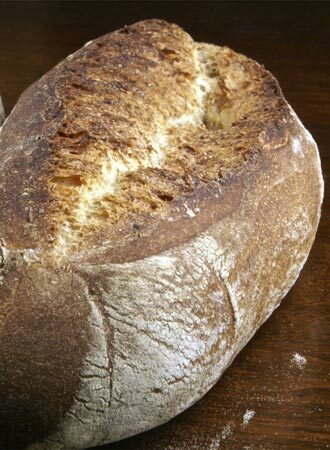 When the sandwich is stood on its side to bake, the loaf opens along the “filling” to create its beautiful characteristic fissure, similar to a fendu loaf, and the steam created by the slurry helps lighten the crumb. The dough needs to be stiff or the loaves will collapse when turned on their sides for baking. (As with all of my recipes) reserve a portion of the water initially during the mixing, then add water as needed to achieve a stiff but workable consistency. 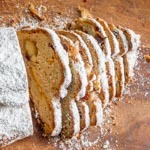 This recipe calls for a layer of bran to be sandwiched in along with the slurry. I have seen other recipes that use corn meal, whole wheat flour, or nothing at all except water. If you use bran or another flour or grain, make sure you do not sprinkle it too thickly, or the halves will separate from each other when the loaves are stood on their sides. When cutting the loaves, make sure your implement is sharp (I use a dough scraper/cutter). Cut quickly, straight down on the dough; don’t drag through it. You want to see a clean division between the two halves of the sandwich; if the halves are stuck together in spots so the seam is obliterated, gently separate them with your fingers or a sharp knife. This bread is going to Zorra (1x umrühren bitte), who is doing me the favor and the honor of hosting YeastSpotting this week. Mix levain ingredients and ferment for 12 hours. In a stand mixer with dough hook, combine all of the final dough ingredients in low speed. Adjust the water as needed to achieve a stiff dough consistency. Continue mixing in low speed to a medium level of gluten development. This might take about 10 minutes, but will depend on your mixer. Transfer the dough to a lightly floured container. Cover and ferment at room temperature for an hour and 15 minutes. Turn the dough into a well-floured counter. Pat it into a rectangle 10 x 15 inches. Fold the dough in thirds, letter-style, brushing off excess flour as you fold. You should end up with a 5 x 10-inch rectangle of folded dough. Place the dough back into its floured container or onto a floured baking sheet, cover, and ferment for another hour and 15 minutes. 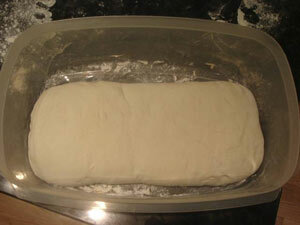 On a well-floured counter, pat or roll the dough into an 8 x 18-inch rectangle. Make a slurry by whisking together 20 g of flour and 100 g of water. Brush the slurry generously over the surface of the dough. Cut the dough in half so you have two 8 x 9-inch rectangles. Sprinkle one half evenly with bran. 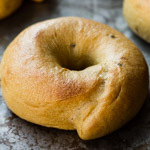 Flip the un-branned half of the dough over onto the bran-covered half to make a sandwich with the wet sides and the bran in the middle. 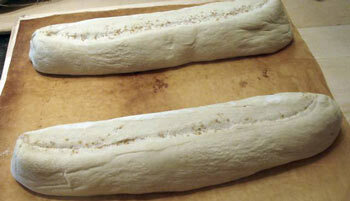 With a dough cutter, cut the dough into three strips, each 3 x 8 inches. To bake, carefully turn the proofed loaves on their sides so the seam is facing up. Placing them on parchment paper helps get them in the oven without falling over. Once the loaves are in the oven, reduce the temperature to 450F. Bake for 10 minutes with steam, and another 25 minutes or so without steam. Then turn off the oven and leave the loaves in for another 10 minutes, with the door ajar. Another technique to learn. Thank you Susan. I’ll be practicing for this one. Wow, gorgeous. I am definitely putting this on my short list. Thanks. 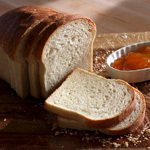 Hope you had a Good Holiday…..
It’s amazing how it changes the texture of the bread as well as the shape. That’s really interesting. It is indeed surprising that a stiff dough produces such a lovely texture. What a beautiful loaf (as always)! Lovely technique, I have to try that too, I like that a lot. The loaves are looking perfectly. 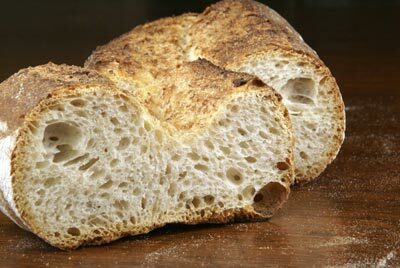 When I did the Pain de Beaucaire some month ago, I was suprised how light the crumb was, because my dough was very stiff, too. 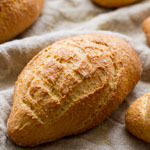 What an interesting method, the bread looks fantastic and comes on my baking list. Oh, this is a great looking loaf of bread! let me make sure I understand – once you put it in the oven, you simply flip the loaf so that the “seam” is on top. No need to shape it, score it, anything? I am very tempted to try it, but a little scared of messing it up. Wow. I’m so impressed. I’m thinking one day, I’ll get into bread in this kind of serious way. That particular bread looks like the kind of I would eat up way too quickly. It looks really crusty. 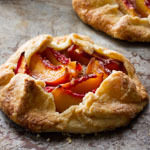 Where do you find all these beautiful techniques and recipes?! Beautiful! I know my way around a kitchen, but I dream of knowing yeast! Your site is pretty amazing. There is no artisan bread to be had in Memphis, TN, so I am determined to make my own…I’ll be back! Wow, this is going to take me some time to do. But will surely try sometime. Bookmarked. This is exactly why you are the goddess of all things bread! Very instructional post. And the final bread looks gorgeous as well. Such a good looking bread! Congratulations! Love the pictures. Beautiful loaf, and the texture looks amazing! I’ve been in a bread rut lately, I may just try this to see if I can get out! The bread looks terrific! I have never seen this method. It is going to go on my pile of recipe I want to try. Thanks! I think it’s partly due to me crowding three loaves on a 12″ pizza stone, though, which is also probably why they didn’t brown on top. Anyway, my real question is about the slurry– it looks pretty thick in your photo, but mine was quite watery. What’s the consistency supposed to be? I’ll be trying this again, thanks for posting it! SallyBR, that’s right, just stand the loaf on its side (although this should be done just prior to putting it in the oven, not once it’s in). Daniel, the slurry is actually pretty thin. Sort of the consistency of a thin milkshake. What a unique baking method! This bread looks beautiful, just gorgeous. I’m saving this recipe. I can’t wait to try it out! Thanks for the great photos. This is one of those things that are hard to visualize based on text instructions alone. I couldn’t figure it out just by looking at the SFBI book. After about a year of no sourdough baking due to the preoccupation of retiring, moving, and the joys of being a new grandmother, I decided to dust off the old mason jars and yet again join in the pursuit of wild yeast. I love the process of getting a new starter bubbling away. Well, I came upon your gorgeous pictures and excellent instructions for this Pain De Beaucaire and my heart sang ! Yes ! I can try this ! I have tried it…..three times now, each a success in their own right; good colour, crust and crumb. My first try was rather comical. The loafs came out looking like the hat that the flying nun wore. Okay, too much bran, not enough slurry. These last two attempts have been lovely, impressing husband and dinner party guests. Thank you, Susan. You rock ! I’m reaching for the butter as we speak. Your bread looks delicious. I know no one’s posted on this in a year, and I know the recipe was a few years back. But I do want to leave a comment and say this bread is amazing 🙂 I did manage not to seal one end on each loaf properly, which lead to quite split open ends during the baking process (on one end of every loaf). They still tasted great, and aside from aesthetics of my loaves, the only issue I always seem to have lately, is developing that open crumb. I always get a fine crumb 🙁 I don’t own a stand mixer, so I ended up kneading this dough by hand, so I don’t know if that has anything to do with it. I just need to improve my technique, I suppose! I enjoy making the recipes from your sight. Thanks for sharing and teaching. When you end to prefer from the measureless disposition of cheap duplicate watches gifts , you could be in for a double extent. 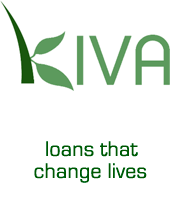 They are so much more affordable than the primordial ones and even if you have the circulating medium, you could very well save it and disburse it on a vacation or a new car, or even buy yourself more time-keeper models and makers. On the other palm and fingers, the nature horizontal of today’s cheap A Lange Sohne Replicas is unsettled. The copying is done at such a level that for example, the solid engravings or the qualities of the magnifying duration glass are copied to consummation. Thanks for sharing excellent informations. Your web-site is so cool. I’m impressed by the details that you have on this site. It reveals how nicely you understand this subject. Bookmarked this website page, will come back for extra articles. You, my pal, ROCK! I found just the info I already searched everywhere and just could not come across. What a great website. owners and bloggers made just right content material as you probably did, thee internet shall be much more udeful than ever before. 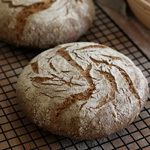 can i use freshly ground whole wheat flour?